Meanwhile, in 12-inch nonstick skillet, cook bacon over medium heat 4 to 5 minutes, stirring occasionally, until crisp. Stir in peas; cook 2 minutes, stirring occasionally. Add water; cover and cook 3 to 5 minutes or until peas are tender and water has evaporated. Add shrimp; cook 2 to 3 minutes, stirring occasionally, until shrimp are pink and firm. Stir in Alfredo sauce and pasta. Cook over medium-low heat, stirring occasionally, until thoroughly heated. Sprinkle with chives. You could use rotini or penne pasta instead of the bow-ties if you like. 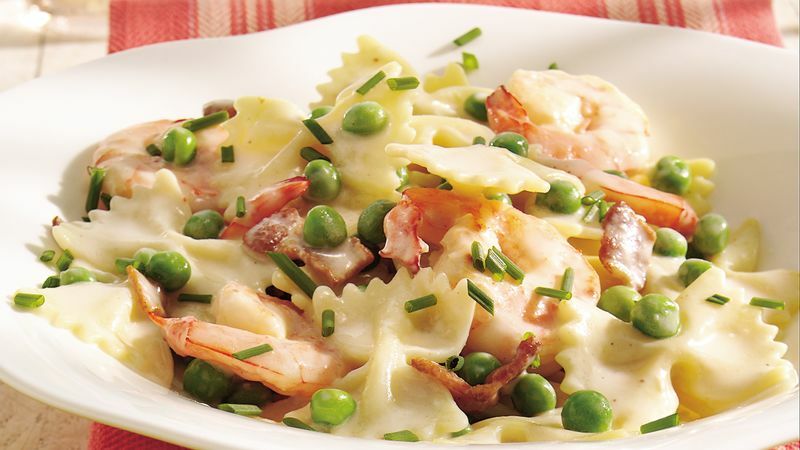 Frozen shrimp can be used, but be sure to thaw them before adding to the skillet.